Station Hollywood: It is a pity that Tabu and Ajay Devgan did not win filmfare awards. It is a pity that Tabu and Ajay Devgan did not win filmfare awards. 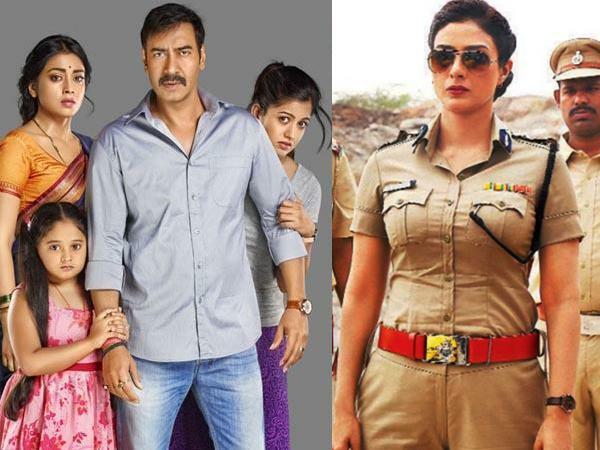 Ajay Devgan and Tabu were brilliant in film Drishyam. They should have won awards for their acting in the film. Ajay Devgan and Tabu did a great job in the film Drishyam. The film was originally made in Malayalam and Mohanlal played the lead role in the film. The hindi version is directed by Nishikant Kamat. It had been produced by Kumar Pathak, Ajit Andhare and Abhishek Pathak. The music had been composed by Vishal Bhardwaj. In the film Ajay Devgan had Cable business in a remote village at Goa. He lived peacefully with his wife played by Shriya Saran and two daughters. Once his daughter went for camping with her college friends. At that camp Rishabh Chaddha (played the role of Sam), the son of Inspector General played by Tabu took ofscene photos of her from his mobile phone and blackmailed her. In haste Ajay Devgan’s daughter hit him with an iron rod and he was killed. Shriya Saran and the daughter buried the body in the garden of the house and told Ajay Devgan about everything. Ajay Devgan made a plan, took the family on holiday, went to Panaji by bus, stayed in a hotel, saw a film and returned back keeping all the bills of expenses. Tabu very seriously interrogated him because one of the police officers Gaikonde saw Ajay Devgan driving the yellow car of Sam. The rest of the film was related to the interrogation. The police tortured Ajay Devgan and his family in the custody, and finally the younger daughter told that the body of Sam was buried in the garden. But when the surrounding area was dug, the body of a dead goat was found. Tabu was suspended along with Gaikonde. Ajay Devgan very intelligently used the stories of films and buried the body in the new foundation of police station. The acting of Ajay Devgan, Tabu were per excellence. Both of them deserve a number of awards for outstanding performance. The film had very unique storyline. The film had done business of 42 crores in 5 days but is destined to do better. The music was good and the song “dum ghutta hai” by Rahat Fateh Ali Khan, Rekha Bhardwaj stands out. Everyone should watch the film.